Gary Whittle, Kirsty Robins, Joss Donnelly and two friends took part in a 24 Hour Spinathon to raise money for The Special Olympics Solent. 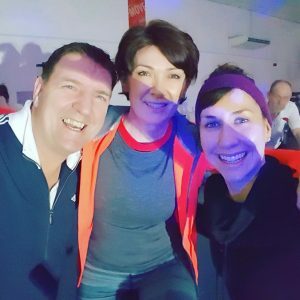 The event which was organised by Active Nation saw 19 teams take part and share the non-stop “Spinning” across a 24 hour period. The Meachers team raised over £600 and at last count the whole event raised over £4000 with money still being donated. All proceeds from this brilliant event went to Special Olympics Solent. Special Olympics Solent’s mission is to provide year-round sports training and athletic competition in a variety of Olympic sporting disciplines, for all children and adults with intellectual [learning] disabilities, giving them opportunities to develop their physical fitness, demonstrate courage, experience joy and participate in sharing skills, gifts and friendship with their families, other Special Olympics athletes and the community.